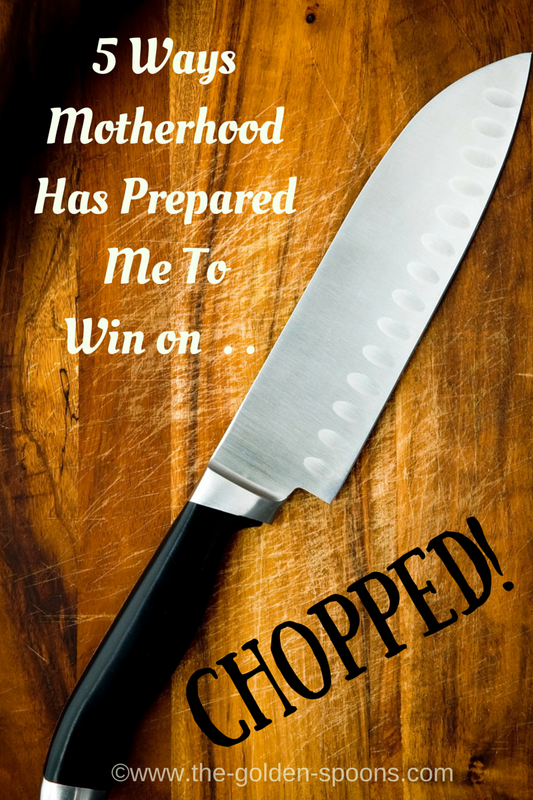 The Golden Spoons: 5 Ways Motherhood Has Prepared Me To Win on CHOPPED! 5 Ways Motherhood Has Prepared Me To Win on CHOPPED! Are you familiar with the TV show "Chopped" that airs on the Food Network? Basically, 4 chefs compete in three timed rounds of competition. They are given a basket full of unknown (and usually weird, unrelated) ingredients. They must use those ingredients to prepare an appetizer, a main course, and a dessert. Each course is judged by some professional chefs and restauranteurs, then, one player per round is chopped (i.e. eliminated), leaving one person victorious. The winner receives a $10,000 prize. First of all, let me make it very clear that I am not actually going to compete on "Chopped." Sorry to disappoint! I do love to cook, though and I even have an entire recipe section here on my blog. However, I am certainly no gourmet chef. All my "formal" training comes from a lot of my mom, some from my mother in law, and a hefty serving of trial and error. Despite my lack of culinary expertise, as I was watching the show the other day, it occurred to me that is a lot going on for the competitors other than just cooking - some things for which skills learned in motherhood would be quite useful. If I ever was on chipped, motherhood would give me an advantage because . . . . . I'm used to my food be scrutinized, judged, and criticized. Seriously, those Chopped judges have got nothing on a picky toddler or a persnickety eight year old! The food critics at my table are especially discriminating when I present to them something different and new. I would be completely prepared (and probably rather immune to) anything the professional judges might throw at me. I always cook with a ticking clock in the background. The only difference is that my clock comes in the form of a "hangry" 11 year old, an impending soccer game, or a very small window of time between riding lessons and bedtime - OR all of the above! Instead of a TV show host constantly reminding be of the countdown, I have a family who not so casually saunters through he kitchen to check on my cooking progress or shoots more than a few "What's for dinner?" and "How much longer?" questions my way. I am forced to improvise recipes on a regular basis. At least once a week, I have to make adjustments to my planned menu due to an ingredient I forgot, a schedule change, or the fact that I forgot to thaw something ahead of time. Just tonight, I realized that the chicken recipe I had planned to try was actually a crock pot recipe - only I forgot to put it in the crock pot earlier in the day. So, at 4:30pm, I was doing an internet search for a skillet version, but the ones I found required an ingredient I did not have. What did I do? I took all the recipes into consideration and improvised my own version. It was actually pretty good! I know I could take the ingredients in those baskets and come up with something edible. Like most moms, I am an excellent multi-taker! Sauce joining on the stove, ice cream freezing in the machine, and pastries baking in the oven while chopping strawberries and figuring out what the heck to do with the cheese puffs? No sweat! Usually when I'm cooking, I am also helping with homework, conducting piano practice, cleaning something, and refereeing sibling arguments. I've got this! Money is a very good motivator!! Sure this is true for any contestant on a TV reality show, but it is definitely true for moms! My kids outgrow clothes ten times faster than they go out of style and they eat us out of house and home! We've got to pay for college and weddings - we need that cash!!!! See? I am completely prepared just in case I should ever get the joy of having a chance to be on "Chopped"! Well, you know, except for my lack of actual culinary competence, that is. If you ever had the chance to be on a reality TV competition, which one would you rock? This post is part of the One Word Linkup hosted by Janine of Confessions of a Mommyaholic and me. Participants chose one of the three word prompt choices, write a post inspired by that word, and link up. This month, the choices were JOY, DIFFERENT, and NEW.